Can I just say how much I love my readers and fans? I hope you know how much I appreciate all of your amazing comments and support in keeping this blog going. I especially love when readers send me messages and recipes that they want me to try. This recipe was sent to me from a reader telling me that I have to try it! With it being only 5 ingredients and taking 5 minutes to make, I couldn’t wait to make it for our football party! 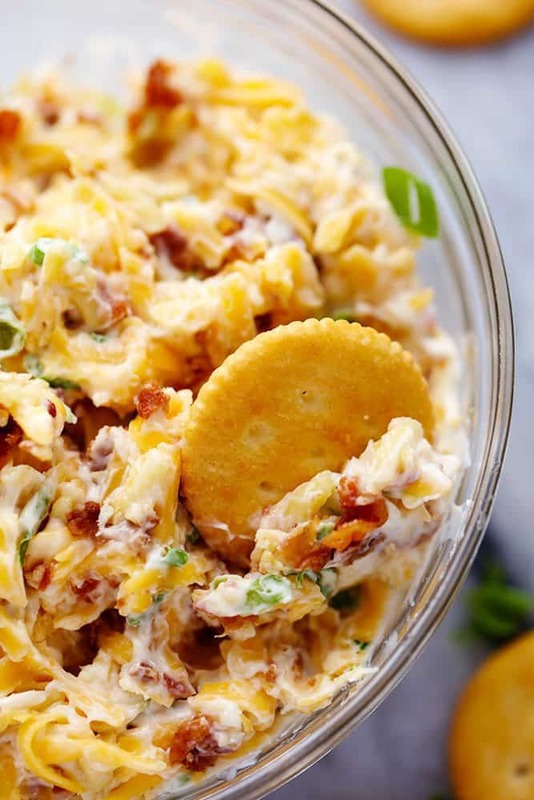 This dip has mayonnaise, green onions, cheddar cheese, and bacon bits. 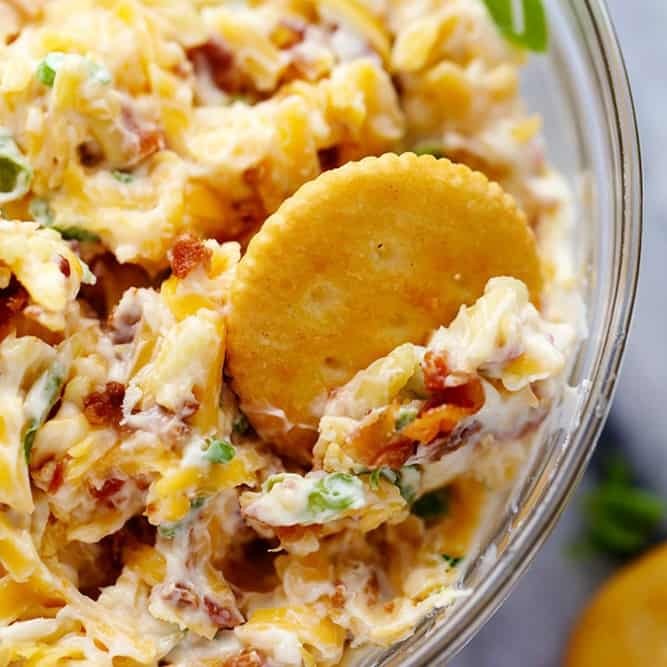 If you are looking to substitute the mayonnaise you can use greek yogurt, or even sour cream, but the mayonnaise is a key ingredient in bringing this dip all together. 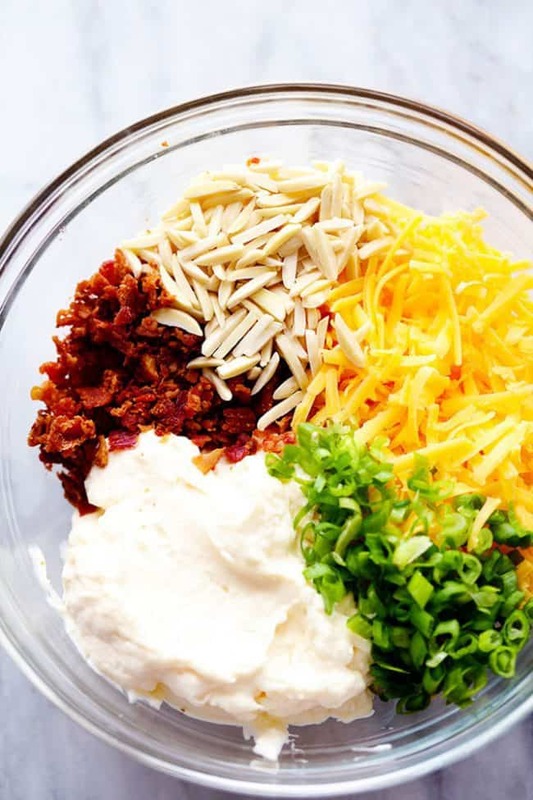 I loved all of the ingredients in this dip and the slivered almonds were my favorite part! They added the perfect crunch to this dip. 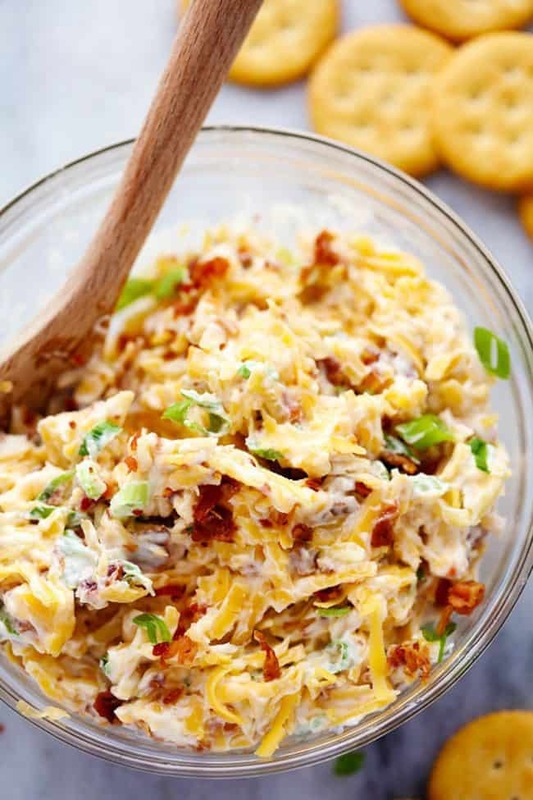 It is a MUST make dip for your next football party or gathering. Everyone won’t be able to get enough of it! You will quickly see why it is called a Million Dollar Dip! Don’t forget to enter in our $550 holiday cash giveaway! I made the dip this morning. I just tasted it and it is very salty. Is there anything I can add to take some of the salt out? Delicious dip and easy to make. 1/2 cup of bacon bits equaled 1/2 pound of bacon. I used 1 Cup of Mayo (with olive oil) and 1/2 cup Greek Plain Non-fat yogurt. Brought it to a gathering hosted by a former caterer from Spain. She loved it and asked for the recipe. Thanks! What is the total serving size on this? I am trying to calculate Net Carbs per serving. Thanks! I just made this for “Dip Day” at work tomorrow, and after I tasted it I kept out a little to have for dinner with zucchini chips (plain dehydrated zucchini slices) and cherry tomatoes. I think it is pretty paleo/keto also, if I’m not mistaken. Anyways, I love it! Thank you for sharing the recipe! Hello. My favorite mayo to use is Miracle Whip because of the sweet taste. What mayo did you use or heard of others using? Your recipes are simple and easy to make and have a great taste. Has anyone tried to make this without the scallions? I don’t have any almonds, so I thought about using pecans. What do you think? Also, would you toast them before putting them in to add too the crunch? When you make this million dollar dip, do you use the green and white part of the onion? Just the green part of the onion. I made this today (Christmas Day) to take for dinner at my cousins house. I was looking for something quick and easy. The reviews said it was great but I was doubtful – it looked kind of odd but I had all the ingredients so I gave it a go. OMG – Everyone loved it! The 14 year old teenager ate almost the whole bole! She loved it and everyone else did. This is definitely a keeper. I only have one complaint – when I got home and went to check the recipe to put in my recipe file I couldn’t find it – I couldn’t find it under appetizers – or did I just miss it? Either way, it’s a 5 star keeper for me! This dip is so yummy! I had the original recipe at a friend’s house. Today I made it myself but changed the almonds to water chestnuts sliced into sticks( my daughter has a nut allergy). The result was excellent! Still has a crunch from the water chestnuts. We all loved it and so easy to make. Your video shows sliced almonds, not slivered. Which do you use? any option to substitute for almonds, if i need to be nut-free? Would appreciate how many this 5 minute million $ dip serves? What are the nutritional facts on this dish? I love it! How many servings in this? Can you add nutrition info? Thanks! There are about 8 to 10 servings but will feed a medium to larger crowd especially if there are other appetizers there. This was so good, everyone wanted to skip the main course and just eat this. Is okay to leave the dip sit out when serving it? Would it be okay to substitute real cooked crumbled bacon for the bacon bits? Do you think it would be okay to use real cooked bacon? Like crumbled? Awesome, I’ll try it out and let you know. Thank you so much. You’re saving my life tomorrow. Love this dip….positively addicting! I made mine with 1/2 mayo and 1/2 sour cream and chopped up real bacon. Definitely make it the night before if you can to allow flavors to meld. What kind of chips or crackers would you suggest? I love just a good salty chip but really this dip goes well with any kind of chip, crackers or even bread slices. It is that versatile! Can I substitute turkey sausage crumbles instead of the bacon bits? Can you use yogurt or sour cream in place of mayo ? I hate mayo. I like Hillmans for this recipe but miracle whip will work great too! So ADDICTING! I like to serve it to myself….with a spoon. Every time I take it somewhere I am asked for the recipe. Thank you thank you for this delicious, easy recipe that uses simple ingredients that I always have on hand. haha! You are awesome! I am so happy that you love it so much! Thank you so much for sharing! Do you use the bacon bits in the jar? I like to use fresh bacon and chop it up. If you like the taste and flavor from the bacon bits that is great too!